The trigeminal nerve, CN V, is the fifth paired cranial nerve. It is also the largest cranial nerve. 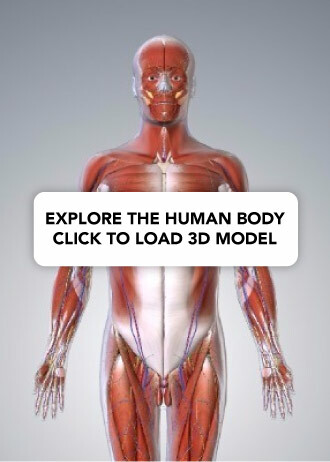 In this article, we shall look at the anatomical course of the nerve, and the motor, sensory and parasympathetic functions of its terminal branches. The trigeminal nerve is associated with derivatives of the 1st pharyngeal arch. Sensory: The three terminal branches of CN V innervate the skin, mucous membranes and sinuses of the face. Their distribution pattern is similar to the dermatome supply of spinal nerves (except there is little overlap in the supply of the divisions). Motor: Only the mandibular branch of CN V has motor fibres. It innervates the muscles of mastication: medial pterygoid, lateral pterygoid, masseter and temporalis. The mandibular nerve also supplies other 1st pharyngeal arch derivatives: anterior belly of digastric, mylohyoid, tensor veli palatini and tensor tympani. Fig 1.0 – The origin of the sensory aspect of the trigeminal nerve. Note that the nuclei are situated within in the CNS, and the ganglia outside the CNS. 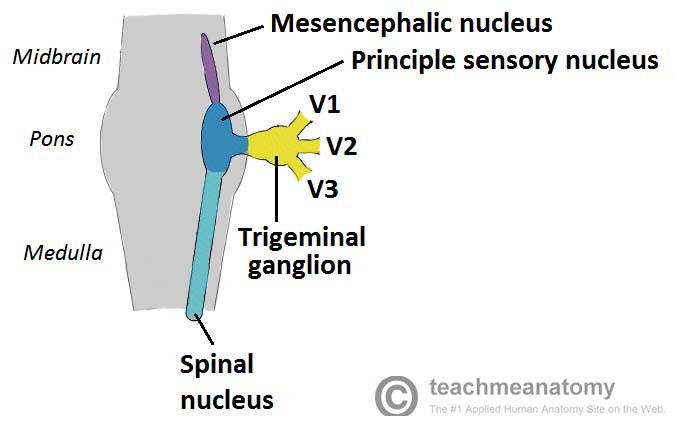 The trigeminal nerve originates from three sensory nuclei (mesencephalic, principal sensory, spinal nuclei of trigeminal nerve) and one motor nucleus (motor nucleus of the trigeminal nerve) extending from the midbrain to the medulla. A nucleus (pl. nuclei) is a collection of neurone cell bodies within the central nervous system. At the level of the pons, the sensory nuclei merge to form a sensory root. The motor nucleus continues to form a motor root. These roots are analogous to the dorsal and ventral roots of the spinal cord. In middle cranial fossa, the sensory root expands into the trigeminal ganglion. A ganglion (pl. ganglia) refers to a collection of the neurone cell bodies outside the central nervous system. The trigeminal ganglion is located lateral to the cavernous sinus, in a depression of the temporal bone. This depression is known as the trigeminal cave. The peripheral aspect of the trigeminal ganglion gives rise to 3 divisions: ophthalmic (V1), maxillary (V2) and mandibular (V3). The motor root passes inferiorly to the sensory root, along the floor of the trigeminal cave. Its fibres are only distributed to the mandibular division. The ophthalmic nerve and maxillary nerve travel lateral to the cavernous sinus exiting the cranium via the superior orbital fissure and foramen rotundum respectively. The mandibular nerve exits via the foramen ovale entering the infra-temporal fossa. (Note – be aware that while we talk about the nerves exiting the cranial cavity, the sensory components can also be said to be entering the cranial cavity, since they are afferent fibres). 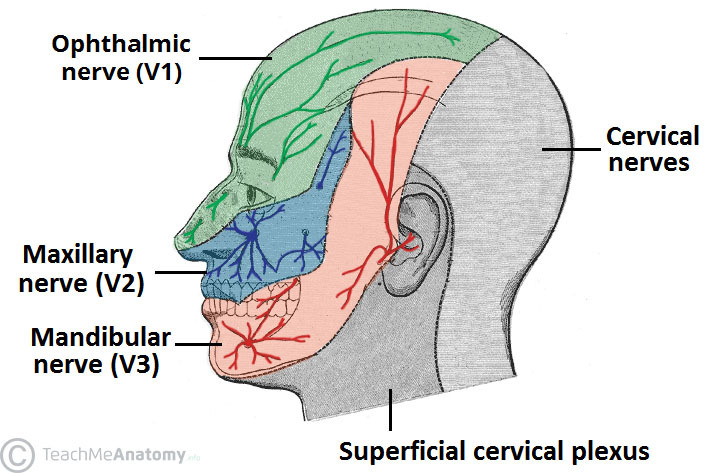 Fig 1.1 – Overview of the deep distribution of the trigeminal nerve and its terminal branches. 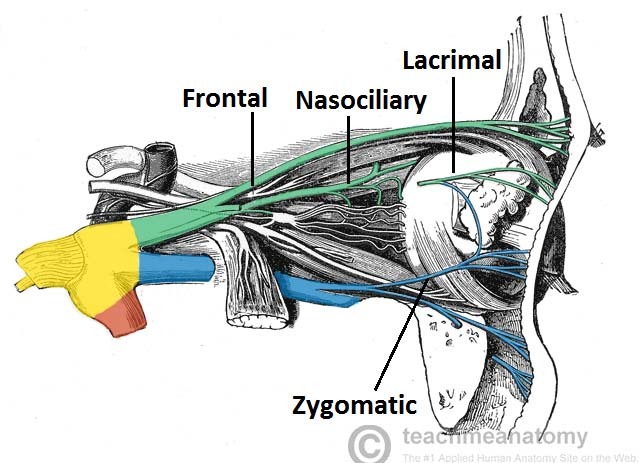 Lacrimal gland: Post ganglionic fibres from the pterygopalatine ganglion (derived from the facial nerve), travel with the zygomatic branch of V2 and then join the lacrimal branch of V1. The fibres supply parasympathetic innervation to the lacrimal gland. Fig 1.2 – Nervous supply to the orbit from the ophthalmic and maxillary nerves. (other nerves e.g. orbital, not labelled). Note that the lacrimal nerve has been partly removed to expose the underlying structures. The corneal reflex is the involuntary blinking of the eyelids – stimulated by tactile, thermal or painful stimulation of the cornea. In the corneal reflex, the ophthalmic nerve acts as the afferent limb – detecting the stimuli. The facial nerve is the efferent limb, causing contraction of the orbicularis oculi muscle. If the corneal reflex is absent, it is a sign of damage to the trigeminal/ophthalmic nerve, or the facial nerve. Fig 1.3 – The corneal reflex pathway. Fig 4 – Cutaneous innervation to the head and neck. 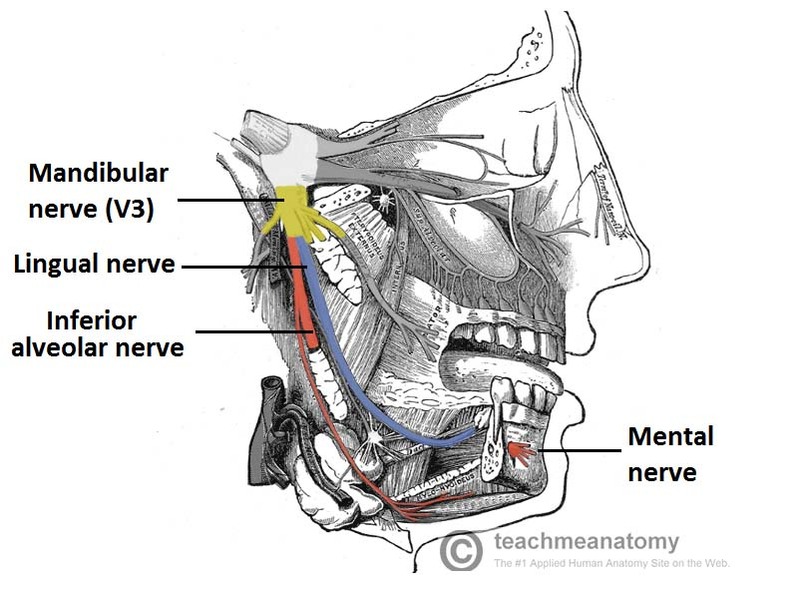 Mandibular nerve gives rise to four terminal branches in the infra-temporal fossa: buccal nerve, inferior alveolar nerve, auriculotemporal nerve and lingual nerve. These branches innervate the skin, mucous membrane and striated muscle derivatives of the mandibular prominence of the 1st pharyngeal arch. Submandibular and Sublingual glands: Post-ganglionic fibres from the submandibular ganglion (derived from the facial nerve), travel with the lingual nerve to innervate these glands. Parotid gland: Post-ganglionic fibres from the otic ganglion ganglion (derived from the glossopharyngeal nerve, CN IX), travel with the auriculotemporal branch of the V3 to innervate the parotid gland. Fig 1.5 – Anatomical course of the inferior alveolar and lingual nerves. Note the close proximity of the two nerves. The portion of the inferior alveolar nerve that runs through the mandibular canal has been removed. The inferior alveolar nerve, a branch of V3, travels through the mandibular foramen and mandibular canal. Within the mandibular canal, the inferior alveolar nerve forms the inferior dental plexus, which innervates the lower teeth. A major branch of this plexus, the mental nerve, supplies the skin and mucous membranes of the lower lip, skin of the chin, and the gingiva of the lower teeth. In some dental procedures which require a local anaesthesia, the inferior alveolar nerve is blocked before it gives rise to the plexus. The anaesthetic solution is administered at the mandibular foramen, causing numbness of area supplied by the inferior alveolar nerve. The anaesthetic fluid also spreads to the lingual nerve which originates near the inferior alveolar nerve, causing numbness of the anterior 2/3 of the tongue. Testing sensory supply: ask the patient to close their eyes and introduce a cotton wisp to areas of the face supplied by the three divisions of the trigeminal nerve to detect tactile sensory competence. Testing motor supply: ask the patient to clench their jaw as you palpate superior to the zygomatic arch to feel for contraction of the temporalis and then repeat palpating inferiorly for the masseter. Ask the patient to open their mouth and deviate their mandible to the right and left to check for competence of the medial and lateral pterygoid muscles. Test for corneal reflex – note this requires a competent ophthalmic branch and temporal and zygomatic branches of the facial nerve. 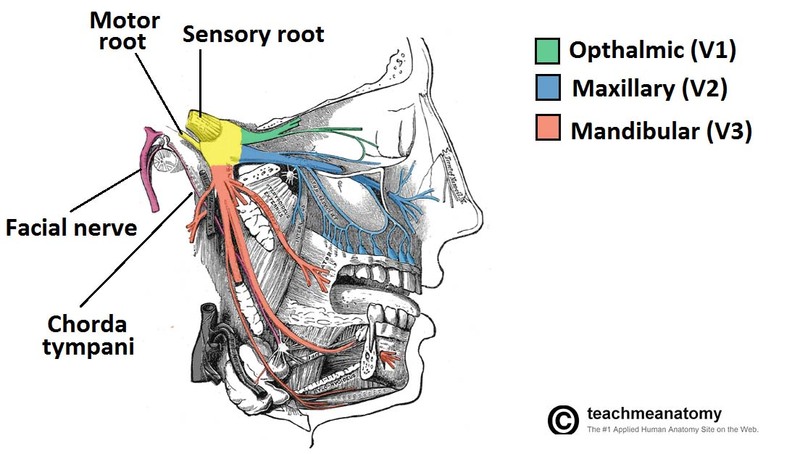 The trigeminal nerve provides innervation to muscles from which pharyngeal arch? Which branch of the trigeminal nerve carries motor fibres? The maxillary nerve exits the cranium through which structure?